The only thing to be ever produced at Helgoland, Germany. 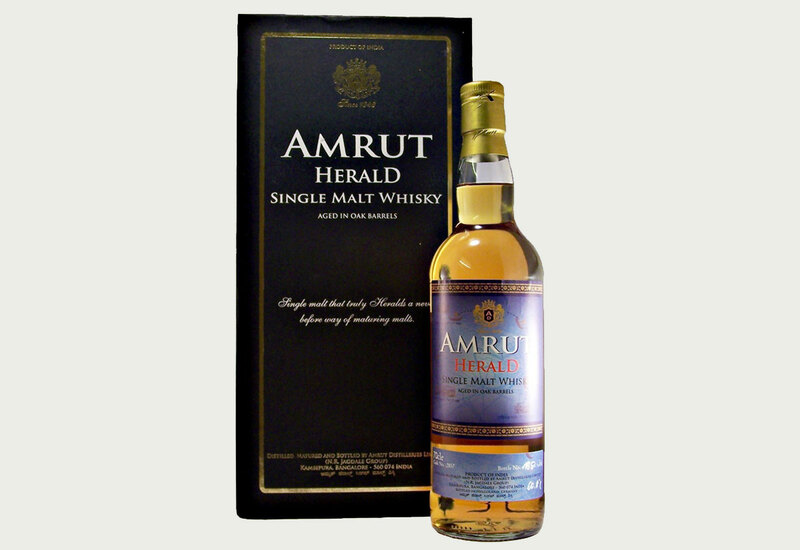 Amrut Herald is a next step forward from Amrut Distilleries. After being awarded "Young World Whisky Distillery Award" by Malt Maniacs in 2010, it is another milestone to create a product with distinct personality with tale and serenity. This single malt travelled almost close to 5000 miles to touch the finishing line. Un-peated malted barley sourced at the foot of the Himalayas, Initially distilled and matured in the city of Bangalore, India, after the thirsty Angels of Bangalore have had their sumptuous share and the aged spirit has qualified to be called as whisky, the barrels were moved to an un thinkable location; Helgoland (167 ft above sea level with a average humidity of 82.9%); a small German Archipelago in the North Sea. The whisky was matured there for a further period. The sharp contrast in altitude, humidity and temperature have had an impact on the maturing whisky and led it to an extra ordinary finale. AMRUT is the first whisky ever to be matured in this Island! AMRUT HERALD; revealing an unthought phenomena!